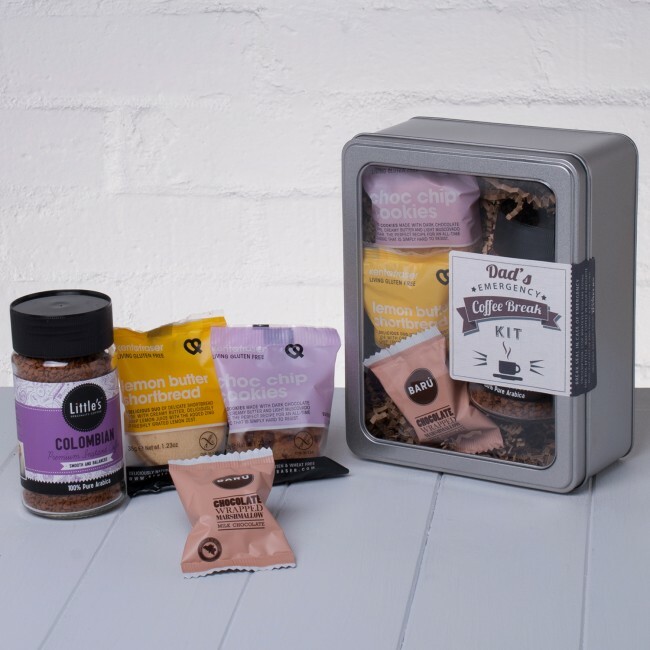 If you know a Coffee-Mad Dad who just can't get through the day without a regular Caffeine Hit, then our Emergency Coffee Break Kit is the perfect gift We've combined the key components of the very best Coffee Break and packaged them in 'Emergency Kit' form - just imagine the smile on the Coffee-loving Dad's face when he realises that you've sent him rest and relaxation in a tin. An instant Coffee Break makes a unique Father's Day Gift, Birthday Present or Christmas treat or is a wonderful way to show just much you appreciate a brilliant Dad and all he does for you. Once the kettle is on, all the lucky Dad has to do is break the seal on their Emergency Coffee Break Kit and they'll be enjoying a restful, relaxing and restorative Coffee Break in no time! We've chosen a rich Colombian Coffee and combined it with some tasty biscuits and a Chocolate Covered Marshmallow to finish. Presented in a stylish window tin lined with kraft shred and finished with a 'Break Seal in Case of Emergency' label, it’s a ‘ready to give’ gift - you can even add a personal message and specify delivery direct to the lucky Dad. Really didn't expect it to look as good as it does, I was positively surprised receiving it and I am sure my dad will love it too. I will definitely come back to look for more gifts in the future. Thank you!